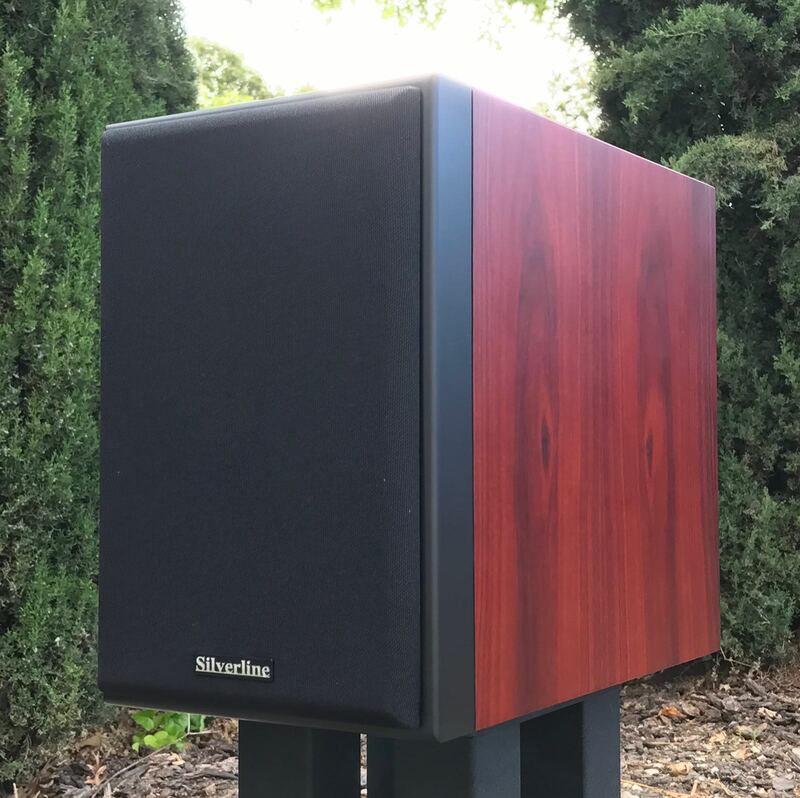 Since 1996 Silverline Audio has been manufacturing high-end premium quality loudspeakers at affordable sensible and realistic prices in their California facility. Each pair of Silverline loudspeakers is slowly and carefully hand-crafted. We carry the full line but the two models listed below offer unusually high value. Prelude - wonderful slim column speaker in Cherry vinyl, $1,499/pr. For over a decade, The Silverline Minuet speakers have set up a new level of performance for compact sized monitors under $1000.00. This new Minuet Grand raises the bar in a more expensive monitor that will finally work in larger rooms with greater dynamics. The Minuet Grand uses all new drivers and an enhanced crossover network. The new mid-woofer has an amazing long excursion as well as high power handling capability. It comes with a 5.25-inch treated paper cone housed in a rigid die cast aluminum basket, delivering incredible dynamics and high definition. The over-sized magnet motor and larger voice coil allow it to handle high current effortlessly and precisely. The new ultralight weight titanium diaphragm tweeter provides superb transparency and more air. The imaging is superb and dynamics and bass blew us away. This is one serious monitor. "In the Audio SUMMA room, I was supremely impressed by the new Silverline Audio Minuet Grand Monitors ($1999/pair), which were premiering at the show." "For $1999, the Minuet Grands are an excellent deal." "...The Preludes' single most impressive attribute was their ability to present a sound that was big dynamically and spatially..."
Building on the accumulation of experiences and technical improvements throughout the last five years in the Prelude, a newly designed Prelude Plus loudspeaker will become a reality in the summer of 2013. The new Prelude Plus loudspeaker features a ultra slim design with 5 drivers for more dynamics, a larger soundstage and better bass than the standard Prelude. The new Prelude Plusloudspeaker features a soft dome tweeter and four treated paper cone, long throw mini mid/woofers. The Prelude Plus loudspeakers generate an incredibly big soundstage from their small enclosures. Sweet highs, warm mids, and fast, tight, powerful bass makes for a sound that is vivid and revealing. The Prelude Plus speaker is highly efficient @92 dB 1 watt/1 meter and is an excellent choice for both low power SET and high current solid state amplifiers. It is designed not only for traditional 2 channel systems but is an excellent choice for multi channel home theater systems too.